At Sunday’s Superbowl game, the NFL tried to make amends with their fans, as they continue to bleed support by embracing and celebrating Civil Rights heroes in America. Those who participated in the ceremony included Martin Luther Kings youngest daughter, Bernice King, as well as, civil rights activist Andrew Young, and civil rights leader and Congressman John Lewis (D-GA). However, despite the fact that the Civil Rights Icon’s own daughter and civil rights leaders personally attending and participating in the event, radical leftists declared outrage and racism! The outrage was led once again by anti-American, anti-Police, and anti-Military Colin Kaepernick! He said that the NFL hypocritically lauds civil rights heroes of the past while blacklisting someone they see as a social justice hero of the present. However, is Kaepernick a truly reliable source of judgment, or is he just another radical “Social Justice Warrior” and member of the “resistance” who is dead set on destroying America. To understand, you have to explore the history of Colin Kaepernick and his mission! The American Football League (AFL) was founded in 1960 and ran for ten seasons. It was merged with the older National Football League (NFL) in 1969. The NFL grew astronomically over the years and became one of the greatest American pastimes. Americans looked forward to the games as they gathered in bars, restaurants, and living rooms to watch the big game. It also became a massive money-maker for businesses, and commercialization of the sport became huge. Meanwhile, football players salaries skyrocketed until more recently, they were raking in payrolls worth millions. Americans were becoming increasingly annoyed at the massive salaries that the players were bringing in, but despite their frustrations, America continued to watch, and in even greater numbers. Commercialization hit an all-time high with the Super Bowl, which became one of the most commercialized events of the year. With billions of dollars being spent, companies like Anheuser Busch and others, they would spend millions of dollars on a single advertisement. American’s not as interested in the game would tune in to see the commercials. The half time show would sport glamour, lights, fireworks, and many times scantily clothed women parading on stage in front of the world. An organization that had been primarily a sport born out of the American dream was becoming twisted and perverted by anti-christian values. But it didn’t stop there. On September 1, 2016, San Francisco 49’ers quarterback Colin Kaepernick took a knee during the national anthem and was booed at Qualcomm Stadium. 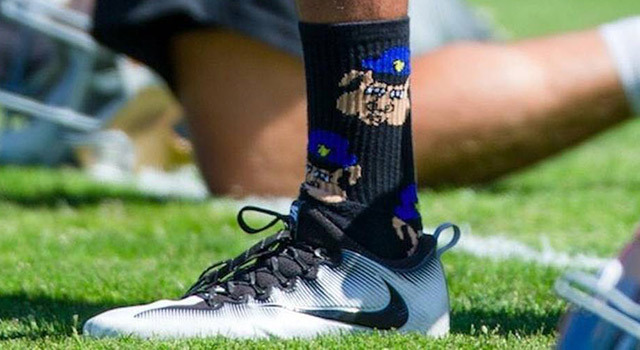 To make matters worse, Kaepernick wore socks that depicted police as pigs. According to multiple reports and accounts, the quarterback wore the socks during multiple offseason practices. Despite objections from the NFL audience, Kaepernick continued to take a knee during the national anthem before games, and he continued to wear socks depicting the police as ‘pigs’. This year, the NFL was able to keep their anti-American mission tamped down, as attendance at games had already hit record lows. Now, as the league tries to walk a tightrope, made by their own actions, the radical leftists like Kaepernick don’t care about right or wrong. In fact, even though Kaepernick was unable to get a contract for two seasons with a team due to his poor performances in the last season he played, and his open hate-speech directed towards the men and women of our nation in uniform, Kaepernick is citing racism and discrimination, rather than admitting his own actions led to self-inflicted repercussions! Furthermore, the radicalized Marxist left is now using his plight and fake rage, to wage a publicized war on Americans and America itself!